INTERTWINED BLACK BAMBOO EARRING, heatbent with one culm; includes brass armature, silver earwire, precious coral and old glass trade beads and Coverlite. Earrings 11.5 - 12.2 cm long. Photographs by Robert K. Liu/Ornament. A long bout of the flu last year and being busy with work precluded much experimenting with my black bamboo jewelry. This Spring, I took time to try out some new ideas. Like a dog with a good bone, an idea with good possibilities needs considerable gnawing before the marrow is reached. Intertwined bamboo has always attracted me, although the technique has limitations as you can only intertwine perhaps three thicker culms and they have to be relatively thin (less than 1.0 cm in diameter), so as to be easily heated to become pliable enough to intertwine. Often, only two culms could be easily intertwined, like the earrings I show here. Also, you may have only enough strength to twist three thicker culms while hand-holding both ends and heating the middle areas until it is pliable enough for intertwining. In addition, it may be necessary to have fairly freshly harvested culms to make really tightly intertwined bamboo, which then need to dry after heatbending. This year, southern California is again in the midst of another severe drought, so our black bamboo grove was not doing well. Instead of growing straight, some culms were bent. I decided to harvest some of the thinner side culms from these bent plants to see if I could try using them for heatbending with a jig. I wanted to have more than 3 culms and heatbend/twist them so that they enclosed a space, somewhat like basketry. The second image shows the first 5 experiments, with the jigs shown for four of the results. I tied 4 to 6 thin culms together at one end with copper or brass wire; this end was held in a vise while I heated and started twisting the culms, each of which had a jig inserted to hold part of the culms apart while I heated and twisted them. Because one end was held in a vise, I could tightly twisted the bundled culms, which were bound with wire before being released from the vise. At first, I settled on a maximum of five culms, as this number was most manageable. Later, using larger jigs and thinner culms, I doubled this number and even did 12 thin culms at the end. 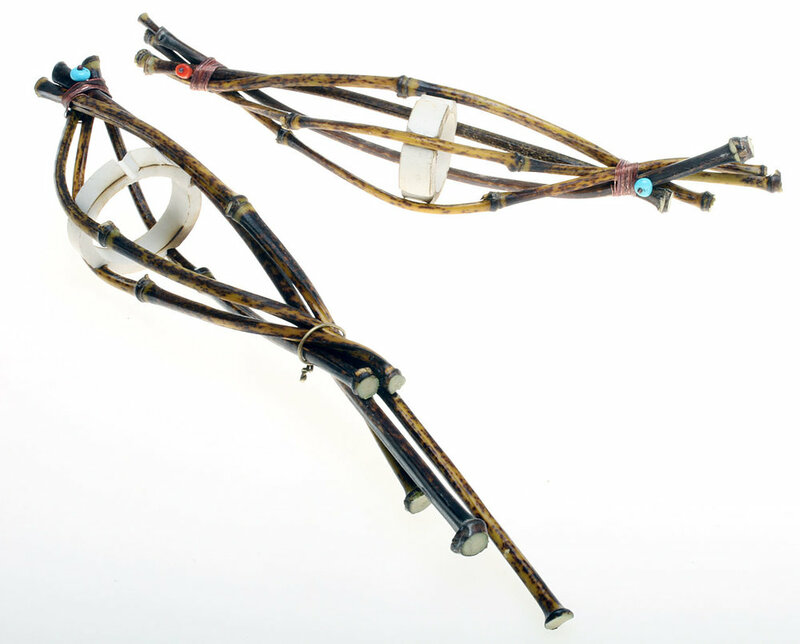 The jigs ranged from soldered wire matrices, a large, 6- sided metal nut, a large bicone glass bead, to grooved pieces of PVC pipe or a carved wood one. The final jig was a thin piece of a bamboo culm that was left in place, as part of the pendant structure. The wire ones do not work, as they are not strong enough to withstand the compressive forces as the culms are heated and twisted. After the jig was inserted and the culms were initially heated/twisted, I clamped the lower end of the bulged culms with wire, sometimes in more than one place to hold everything in place. After each phase of heatbending, the bamboo culms were immediately dipped into water to set or harden them. Usually, it took repeated heating and manipulations to get the intertwined shape I wanted. For the uppermost batch of freshly harvested or culled culms in the second photo, I used a large glass bead as the jig; for the others, a grooved piece of PVC irrigation pipe or a handcarved, grooved wood plug served as jigs. The grooves were to hold the culms in place while I heated and twisted. If the grooves were not deep enough or shaped correctly with a file, they would not hold the culms in place when heated and twisted. This resulted in the culm slipping out of place, so that spacing was not symmetrical. Sometimes a wire was tied around the culms and the jig, as shown in the second experiment, of the second photo. FIVE HEATBENT BLACK BAMBOO EXPERIMENTS, four with jigs still inserted or placed alongside. The pipe jigs are 2.2 to 2.7 cm diameters. You can see how the diameter and length of the jig determines how much flare, the angle of the flare and gracefulness of the bamboo culms surrounding the jig. Note wire holding culms in place; all binding wire needs to be annealed before. I wore leather gloves on both hands to manipulate and hold the culms while everything was heated with my EZ torch; this propane and air torch was held in an armature so that both of my hands were free. The most successful jig is the lowest one, a thin slice of PVC pipe with a groove for each of the culms in the bunch. By shortening the jig, I got the most graceful curve in the cagelike bulge. 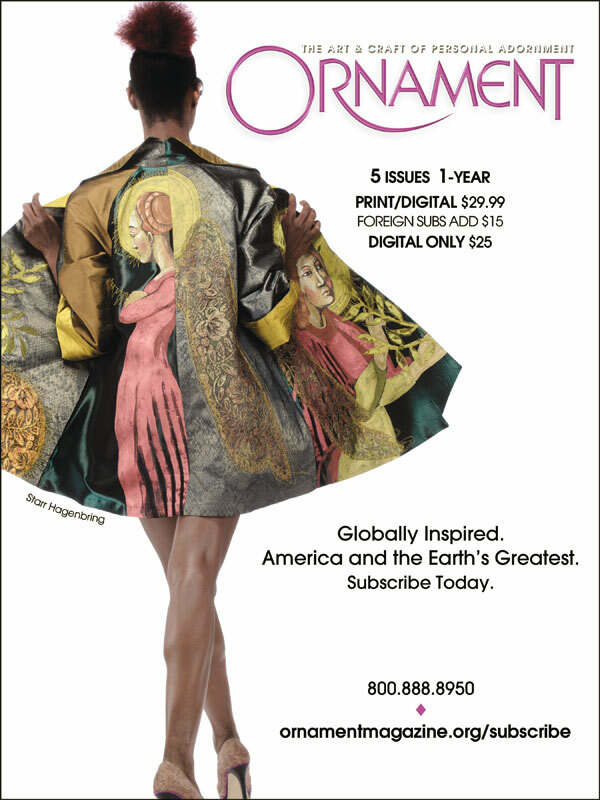 The jig is easily removed by turning it sideways and slipping it out through an open space. TWO HEATBENT BLACK BAMBOO EXPERIMENTS, in progress, with jigs still in place, which are 2.7-3.3 cm diameters. Jigs removed by turning sideways. Charring of pipe due to torch flame. When finished as pendants, one horizontal, one vertical, they were respectively 18.5 and 22.0 cm wide or long. Partially wirewrapped and with coral or turquoise beads. I felt the lowest heatbent bamboo with a short pipe jig and another one with an even larger diameter PVC pipe jig were good enough to use as pendants with heatbent bamboo torques, as seen in the third photo. The other photographs show in progress and finished images of the two pendants and their torques. All fittings are of copper or brass, so that they will oxidize and stay in character with the rustic, natural feel of these necklaces. While these bundled/jigged bamboo pendants have that lyrical quality that I have been trying to achieve, I was still not really happy with the result. Thus I made more elaborate plastic pipe jigs, using portions of pipe slices, which permited oval and even more elaborate jigs, with more surfaces for slots to hold culms. 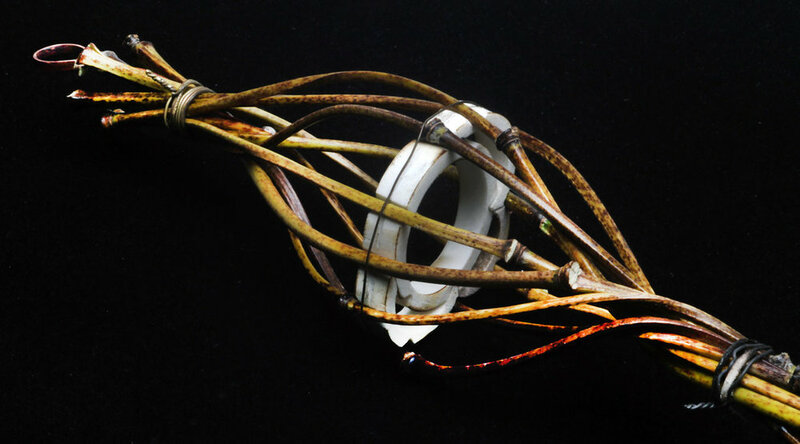 The final ten notch plastic jig, which allowed for ten thin bamboo culms to be used, produced the most satisfying pendant, although it took repeated heatbending, adjusting and waiting for the freshly culled bamboo to dry thoroughly before the final wire-wrapping. While freshly harvested or culled bamboo is the most pliable and best to use when heatbending with a jig, the downside is that it will shrink when it dries. This means that if you wire-wrap too soon, in order to hold the heatbent culms together, the wirewrapping with annealed 26 guage wire may become too loose when the culms dried. I have had to re-wrap some of the jig bent structures. Use temporary binding wire while the bamboo dries, tighening the wire further as the bamboo shrinks; after there is no more shrinkage of the bamboo, do the final wire-wrapping. TEN CULM JIG PENDANT, showing initial heatbending/twisting and with temporary wire ties. Note how culms form basket around jig. TEN CULM PENDANT, after additional heatbending/twisting; note that bulged part of pendant shortens with twisting and portions of culms tied off with wires become more intertwined. ADDITIONAL PENDANT EXPERIMENTS WITH PLASTIC PIPE JIGS, which are glued together with New Glue, and grooved or notched with files, to hold bamboo culms in place while being heatbent and twisted. With greater time experimenting, I was able to produce more interesting shapes with jigged heatbent bamboo, as well as more tightly twisted structures. Much depends on how thin the culm can be for easier heatbending/twisting, yet still hold their strength during these processes and have a large enough diameter to be drilled/burred if necessary. An important factor is that once the wires that initially clamp together the bundles are released so that the final, more decorative wirewrapping can be added, there is the danger during this transition that the bundled structure will change its shape or even fall apart. Then one has to reconstruct it, with varying degrees of success. Thus, keep the temporary binding wires in place until the final wirewrapping is done. In September, I tried another idea, where I made a jig from a large diameter bamboo culm, notched with 12 grooves and then sawed off into a thin disk. The grooves were further deepened and refined to hold the 12 thin culms, then used as a jig like the removable plastic ones I had utilized previously. This bamboo jig is meant to be part of the pendant. The most difficult part of the process is fitting all the 12 culms into the grooves and keeping them in place while using temporary wire ties on the upper and lower ends of the culm bundle. I show a partially finished pendant, before wire-wrapping and insertion of the loop. I am still thinking of how to finish this piece but I think the bamboo slice adds an attractive feature. I show a partially finished pendant, before wire-wrapping and insertion of the loop; the last series of images are of the completion process. I wire-wrapped upper and lower portions of the pendant with the permanent bamboo jig, as well as adding a forged/soldered copper loop. Then I cut off the culms below the lower wirewrap, to shorten the pendant. This was then placed on an intertwinned bamboo torque, with wire-wrapped ends; as all the copper was annealed, it took on heat coloring, so all the metal is in harmony with the browns/blacks of the bamboo. After this summer’s experiments with heatbending with a jig, I think that the most successful jigs will be those with the largest diameter and the thinnest jig, which means the pendant can be shorter and larger or fatter, instead of being long and thinner. Shorter pendants are easier to wear, and larger diameter ones will show better. With bamboo jewelry, excessive weight is never a problem. Undoubtedly, I will continue to gnaw further on this problem, but I may have to wait until the fall/winter rains to help the black bamboo grove recover before I cull anymore. IN PROGRESS VIEW OF VERTICAL JIGGED PENDANT ON BAMBOO TORQUE, showing it attached by a soldered copper loop, meant to rest in a groove filed into the center node of the torque. Each of the ends of the culm that will be decorated with beads or balls are burred prior, so that the attachments sit in a depression and not on the surface of the culm node. 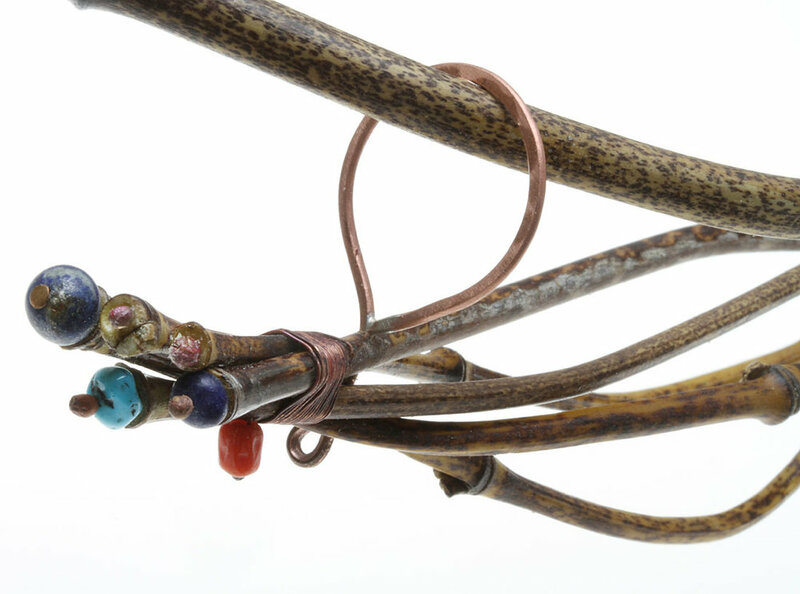 DETAIL OF COPPER LOOP AND WIRE WITH LARGE KNOB, which is trapped by the bundled bamboo culms when it is wire-wrapped with thin, annealed 26 guage copper wire, used on all these bamboo jewelry. HORIZONTAL JIGGED PENDANT ON BAMBOO TORQUE, with faceted Czech glass beads as terminals on torque; pendant hangs from two soldered, forged copper loops. Pendant has been wire-wrapped and the ends decorated with semiprecious stone beads or melted copper balls. Because heatbent black bamboo retains its pliability, the wearer can pull the ends apart when fitting it onto the neck. DETAIL OF SUSPENSION LOOP AND ENDS OF HORIZONTAL PENDANT. Hole was drilled through bundled culms, end of loop inserted, then bent into circle to trap it in place. To add visual interest, ends of wirewrapping and ends of bamboo culms were decorated with lapis, turquoise or coral beads and copper balls; these sit in burred depressions. Because copper suspension loops are forged for strength and thus thin when viewed headon, the pendant appears to float beneath the toque. 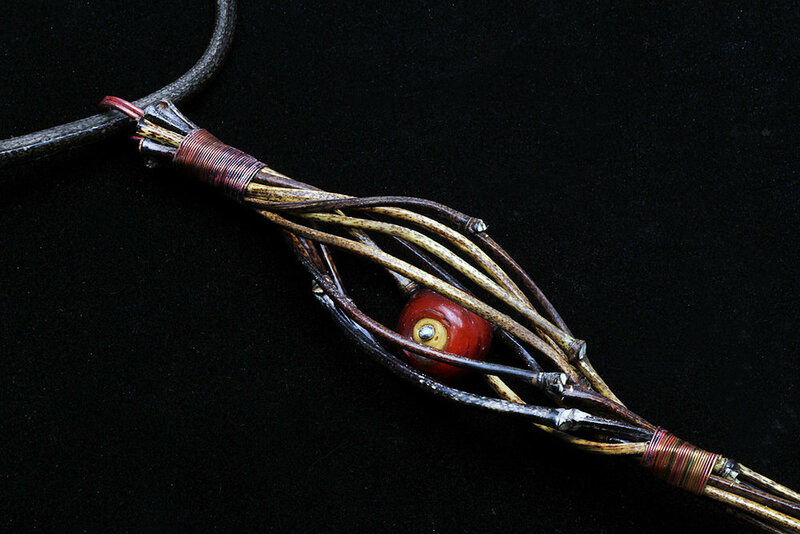 FINISHED TORQUE WITH VERTICAL JIGGED PENDANT OF FIVE CULMS; the torque is also terminated with vintage, facetted Czech glass beads from the African trade, with beads of semiprecious stone or copper balls decorating ends of bamboo culms. CLOSEUP OF FINISHED VERTICAL JIGGED PENDANT, showing how all the ends of the bamboo culms have been decorated to add interest and draw attention to them. In addition to wirewrapping, some of these bundled culms are held together by pins inserted into drilled holes, to add strength. CLOSEUP OF JIGGED PENDANT, still with temporary wirebinding and plastic pipe jig in place. Note that individual culms have pleasing curves and the swirled bamboo has much more shape and resemblance to a basket or lattice-work. ALMOST FINISHED VERTICAL JIGGED PENDANT; the pendant has a soldered copper loop and is wire-wrapped with annealed, fire-colored 26 gauge copper wire, applied after bound culms have thoroughly dried. Vintage Venetian Corneline del Alleppo glass bead has silver topped caps, shown before final assembly with glue. Notice the tight wire-wrapping, which follow the shape of the underlying bamboo culms. DETAIL OF FINISHED TORQUE WITH VERTICAL JIGGED PENDANT, showing the CdA bead trapped inside jigged space, so that it can freely move. Note silver bead cap and how tight wire-wrapping allows bundled bamboo culms to show through. FINISHED TORQUE WITH VERTICAL JIGGED PENDANT; the torque is also terminated with vintage molded Czech glass beads from the African trade; these Czech beads also serve to prevent the pendant from coming off the torque, as the beads are larger than diameter of copper loop. The trapped Venetian bead inside the expanded space of the ten culm pendant freely moves. If you compare this pendant with earlier ones, you can easily see how much more basket-like they are, contrasted to those made without jigs. FINISHED TORQUE AND PENDANT ON FABRICATED BRASS STAND, showing how the jigged pendant hangs. Pendant is 27.7 cm long. EXPERIMENT TO MAKE INTERTWINED TORQUES, with bottom two unsuccesful, top in process of drying, to be further heatbent. Note wire ties. LARGE DIAMETER BAMBOO CULM HELD IN VISE, while it is being grooved; it has already been heated with torch to fire-color the surface. After grooving, it will be sawed off as a thin slice and sanded smooth. CLOSEUP OF OBVERSE OF GROOVED BAMBOO JIG, before it was used for 12 culm pendant. 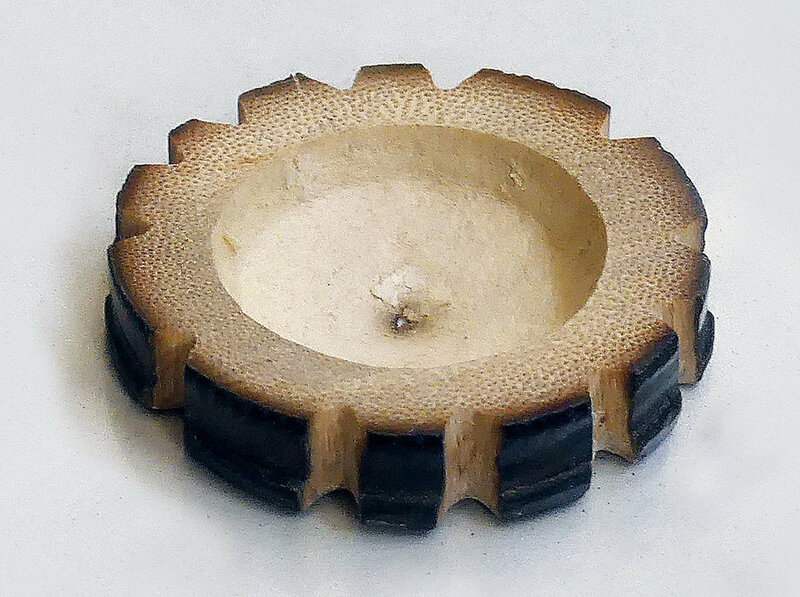 UNDERSIDE OF BAMBOO JIG, showing that it is nearly hollow, with only a thin layer of the culm in the center. FINISHED PREVIOUS JIGGED PENDANT AND TORQUE versus in process pendant with permanent bamboo jig, which needs some repair and wire-wrapping, as well as a loop. IN PROCESS BAMBOO PENDANT, with thin slice of bamboo culm as permanent jig; note temporary wire ties for this 12 culm pendant. COMPLETED PENDANT ON INTERTWINED TORQUE, not yet finished. FINISHED PENDANT AND TORQUE, with wire-wrapped near ends of intertwined torque. Pendant is 17.0 cm long, torque 12.5 cm wide. Neckpiece is held in 2 rod arms of armature for photography. CLOSEUP OF FINISHED PENDANT AND PORTION OF TORQUE, with lower culms sawed off. PENDANT WITH BAMBOO JIG, top wire-wrapped. PENDANT WITH PERMANENT BAMBOO JIG, with top and bottom wire-wrapped, and culms below lower wirewrap sawed off, to shorten pendant. Forged/soldered copper loop inserted.